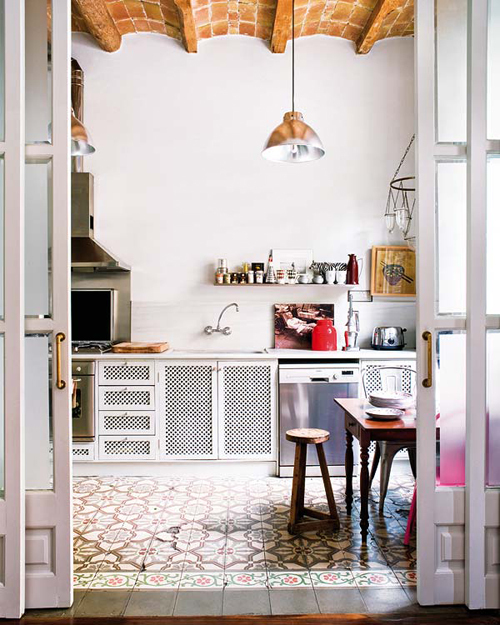 Today I’m loving … this cosy kitchen from decorator Montse Esteva who lives in Barcelona, Spain. I love everything about that kitchen!! it’s all about the floor tiles for me too! This kitchen is so gorgeous. Is that floor painted or are those tiles? Such a lovely kitchen — I especially love the materials used on the ceiling! very unique! Love the tiles and the furniture! Nice style….i like the uniqueness of the ceiling. I want to see that in my modern home kitchen style. I can’t stop commenting…every time I see a new post I love you more and more 🙂 This just keeps getting better every day. I’m a big fan!! this kitchen is just lovely, perfect! 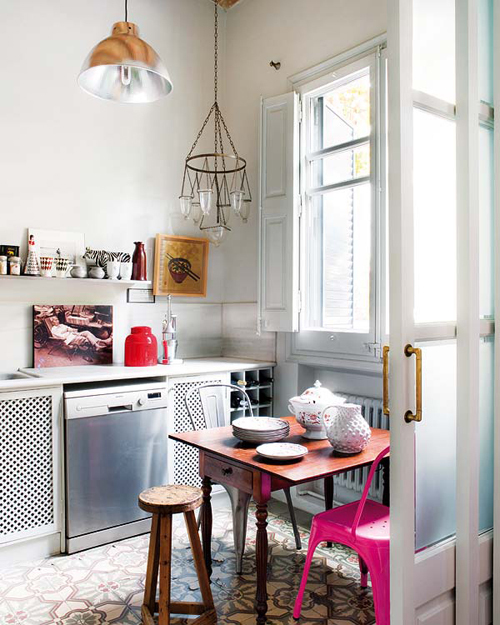 That hot pink chair brings an interesting final touch to the whole style. oh MAN! this kills me! Lovely lovely lovely! This kitchen is to die for! Look at that pink chair! Irresistible! This is kitchen is simply beautiful! Love it. where do you find tiles like this or similar?!!! I would definitely have the sliding pocket doors with frosted glass and the tall window (to bring in sun light) with indoor and outdoor shutters (for privacy and to control the temperature of the room be it cold or too much heat). The Stainless steel Cooking area looks to be something I would enjoy cooking on. Like the idea of the Wine Cozy with the unique lighting above it. The reflection of the ceiling on the Lamps matches the unique Ceiling; nice idea for a Tall Ceiling. I like unique. I prefer matching to a eclectic look myself, so I would not bring in the rest of the decor. It is too ordinary and busy for my taste (cabinet/flooring and furniture). Am assuming the rest of the appliances match the Stainless steel Dishwasher and Faucet. I like how the Faucet is attached to the wall. The White gives everything a clean and crisp look. Would have Fresh Flowers for Color and Scent … to me something is cozy when it touches all of the scenes and is practical. Personally, I would not describe this room as cozy … I perceive it to be functional with an artistic flair . Just being honest here…. mean no offense. We each have our own taste when it comes to expressing ourselves in our homes. I want those drawer fronts and cabinet doors. I love the cottage look and it would be great in my farm kitchen in combo with a more ‘used’ wood cabinet front for some of the cabinets. Can anyone tell me where I can order them from?